On April 23, under immense pressure, Armenian Prime Minister Serzh Sargsyan resigned. This resignation was prompted from 11 days of protests in Armenia, with hundreds of thousands of Armenians peacefully protesting Sargsyan’s appointment to PM after his presidential term ended earlier this year. This protests were headed by former journalist Nikol Pashinian, who heads the opposition party, Civil Contract, and who rebuked the advice of other opposition party leaders in calling for protests against Sargsyan’s appointment. Pashinian was arrested in the early days of the protest under an unclear charge, which prompted even more protests by Armenians even more dedicated to remove Sargsyan from power. All of these protests were peaceful, as the impression was meant to peacefully protest government corruption, not to try and violently overthrow a government. Everyone from all walks of Armenian life joined in on these protests, with young student activists, liberal politicians, civil society workers, and even the military forming a large group of the people protesting the blatant corruption in the Armenian government. 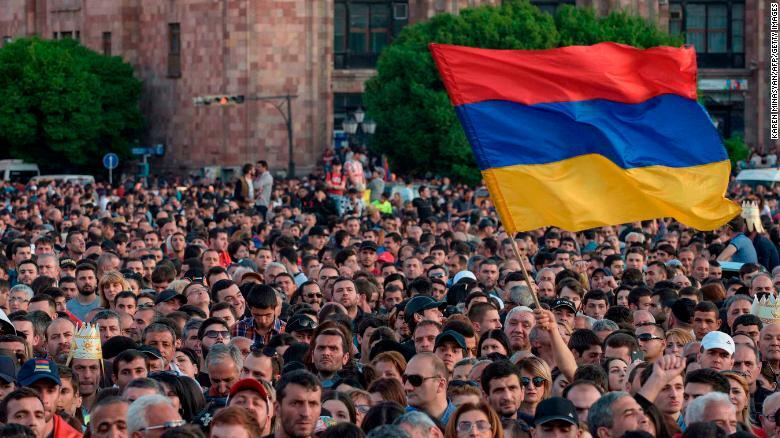 These protests have been brewing for years, with many Armenians being disillusioned by its politicians pulling out from closer military and economic ties with Europe and choosing to align itself with Putin’s Russia. Sargsyan was a main proponent of closer Russia ties, with him pulling out of numerous EU deals as president and choosing Russian economic and military deals instead. Sargsyan appointing himself as PM to continue his hold on power was the last straw for many Armenians. It was reminiscent to what Vladimir Putin did in 2008 when he appointed himself PM after his presidential term ran out. To his credit however, Sargsyan resigned his position without bloodshed, which is something that many leaders in post-Soviet countries have failed to do. These protests showed the world that people power still meant something. Sargsyan, who was an Armenian lion in politics, resigned and surrendered to an unarmed nonviolent crowd. His resignation prompted mass jubilation across Armenia, with young people especially celebrating their historic achievement on getting the corrupt out of Armenia. The next step for the Armenian people should be to hold new elections, monitored by the U.N. for fairness, to get a government that is fairly elected by its own people. This new government will sanguinely help cast aside the chains of government corruption in Armenia and help prepare Armenia for a new era of freedom and prosperity. Hopefully, these protests inspire oppressed people from countries such as Iran, Russia and Turkey that peaceful demonstrations are still the most effective way for change, and that violent means never solve the problem, as seen with the failed coup of Turkish President Erdogan in 2016. History proves this point, with every great movement being sparked by nonviolent protest, such as the peaceful protests of Indians wanting freedom and self determination from the British and the peaceful American civil rights protests of the 1960s calling for racial equality. Lastly, this revolution proved a point to puppet masters like Putin that his efforts to control smaller countries like Armenia through its politicians will not be tolerated by the people for long, as it is human nature for people to want freedom, something that Putin and his corrupt political puppets lack. As President Ronald Reagan once said, “Freedom is never more than one generation from extinction,” and the Armenian people proved that their freedom will never be extinct because of this generation or the next. Amazing what lack of forced MGM will do to males as they grow. Forced circ. is associated with war, violence, mass shootings, and jail. Armenia is 100% circ.-free. :) LIKE ICELAND and SWEDEN and other PEACEful an PIECEful nations. INTACT! I am really impressed with such a peaceful demonstration and urge people keep going .